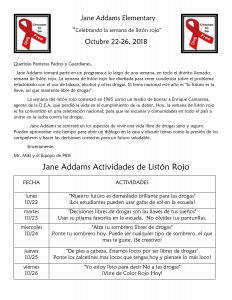 Jane Addams will be taking part in a week long, district-wide program called Red Ribbon Week. 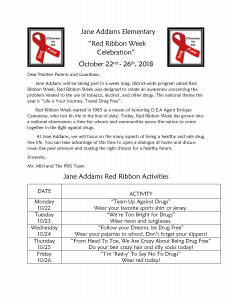 Red Ribbon Week was designed to create an awareness concerning the problem related to the use of tobacco, alcohol, and other drugs. The national theme this year is “Life is Your Journey, Travel Drug Free”. Students will participate in a variety of activities throughout the week to help bring awareness to the dangers of drug use. Click on the images below to learn more.